EK-QDC is a Quick Disconnect Coupling (QDC), a special connector fitting that allows quick and tool-less expansion of any custom loop. Quick Disconnect is a medical grade product with a patent pending Zero Drop design, and is produced by CPC, the leading provider of quick disconnect couplings! EK-QDC is made out of male and female part, with 10mm barb fitting on both ends. The locking mechanism can be released by pressing the button on the female part. This action stops the flow of liquid through the coupling and you are safe to keep it disconnected. Every EK-QDC comes with four black Ezyclik Nylon Hose Clamps. The Ezyclik Nylon Hose Clamp is specifically designed for applications where space is restricted. The unique design of the patented Ezyclik-P ensures strong, fast and reliable fitting. Two enclosed clamps are designed to be used with 10/13 mm tubing and two additional clamps are designed to be used with 10/16mm tubing. Tubes with larger ID (inner diameter) and OD (outer diameter) will not work with this QDC! 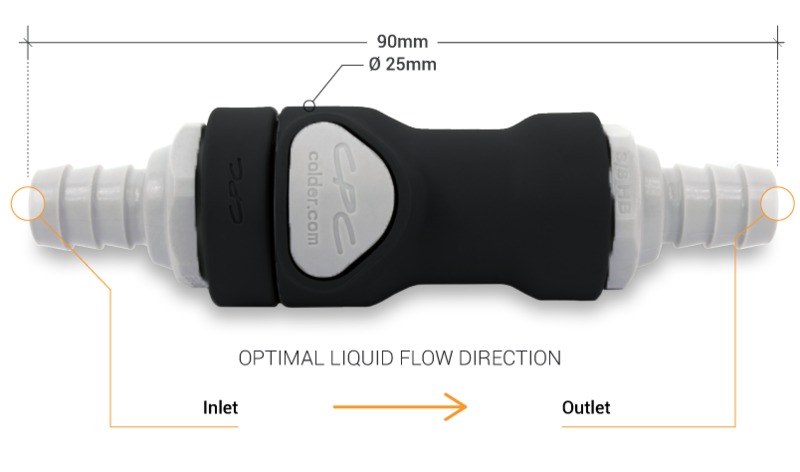 When the QDC is opened (or disconnected) the liquid will not flow through it, so you can not use it as a drain port! In order to use it as a drain port, the QDC must be connected. Keep this in mind when planning your loop! This product can not be used with hard tubing! Only use this product with tubing that has the inner diameter (ID) of 10mm (3/8"). Do not use 12/16mm or 13/19mm tubing! This product can not serve as the drain port because no liquid passes through when the coupling is disconnected! If you want to use it as a drain port, the QDC must be connected. Keep this in mind when planning your loop! Do not use more than four (4) sets of QDC's in a typical custom loop system (with two water blocks and two radiators).